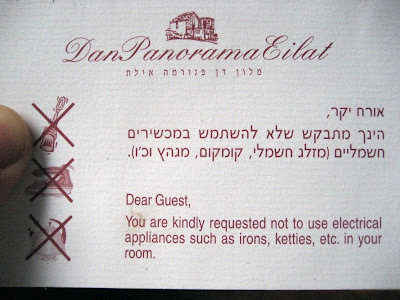 You are kindly requested not to use electrical appliances such as irons, ketties, etc. in your room. which translates to KETTLES. So I'm guessing when someone was translating the Hebrew into English, they used a lowercase L when writing KETTlES, and this was reasonably mistaken for an uppercase i by the non-English speaking printer. By the way, this is not the first time someone has made the grave error of substituting a handwritten lowercase L for a printed uppercase i.